In response to the rise in instances of violent crime, the Home Secretary has recently announced that Police Forces in England and Wales will be given new powers to deal with potential trouble makers. 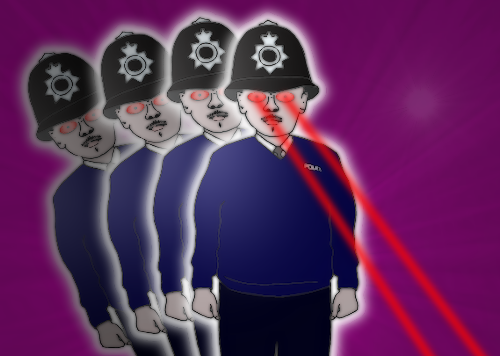 Under the new proposals, police officers will be equipped with X-ray vision, superhuman strength and amazing powers of telepathic mind control. Rumours that they will be able to leap tall buildings in a single bound have so far remained unconfirmed. In Scotland many policeman already have the ability to turn themselves into human dynamos and deliver paralysing bolts of electricity that can stun up to a distance of twenty-five yards. At present these measures have been taken on an experimental basis, but if the scheme proves successful we could soon see officers with the ability to transform into huge green lizard men, like those in America. Although this move has been greeted favourably in most quarters, there remains a sizeable minority who believe that such measures are unnecessary, claiming that the traditional police truncheon is more than adequate for dealing with the majority of incidents.